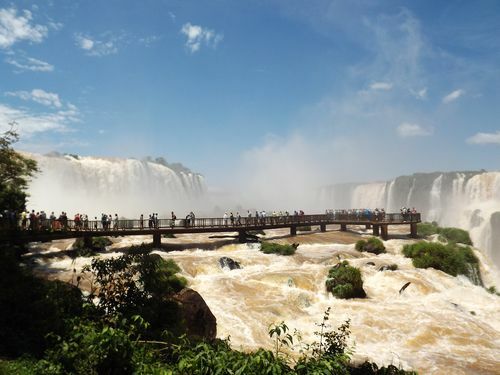 In the southwestern corner of Brazil bordered by Paraguay and Argentina you will find a waterfall beyond belief called Iguazu Falls. This location is a far cry from the teaming rainforest of Amazonia. It is in fact a place where you will find the largest series of waterfalls in the world. At its highest point the falls drop from a height of 269 feet, a total of 275 individual falls (cataracts) covering a distance of 1.7 miles. When we met our guide, Marcos Duarte, he explained that our helicopter trip over Iguazu would be best done that day, so off we went to the helipad. 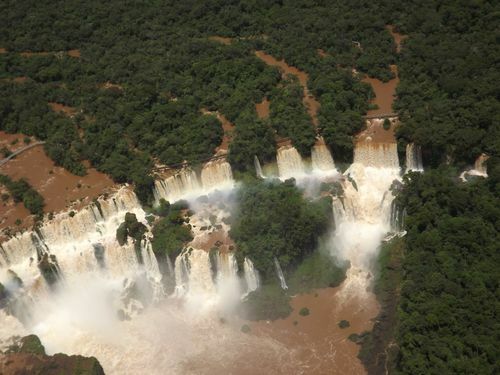 What you see in the picture above is only a small part of Iguazu Falls. It clearly was one of the largest waterfalls I have seen. I have been to Victoria Falls, on the Zambezi River at the border of Zambia and Zimbabwe and Niagara Falls, but nothing prepared me for this place. It seemed that there was water everywhere I looked. Marcos picked us up from the helipad, and I mentioned that I played chess and wondered if he knew someone that I could play. He mentioned a friend, but as things sometimes happen, his friend was not available. The next day when we walked the trail along the falls, he volunteered to learn the game after our stroll. In the picture above we came across a wooden walkway that leads out into the river just below the falls. It is called the Devil’s Throat. As you can see it would get anyone soaking wet if they ventured out. We walked only a short distance and turned back. 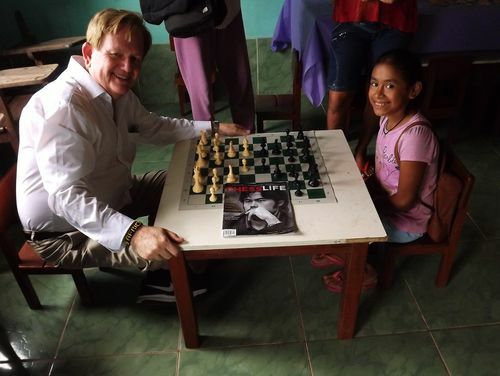 I left the chess set with Marcos and asked him to give it to a student who wanted to learn the game with him. 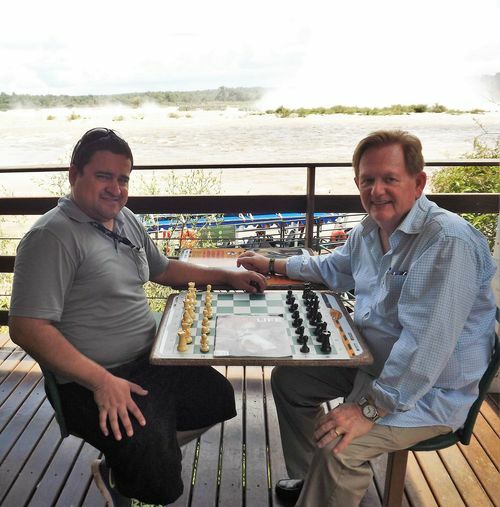 I had now completed my first chess experience in Brazil at a location that few have seen and likely fewer have ever played a game of chess next to this waterfall. 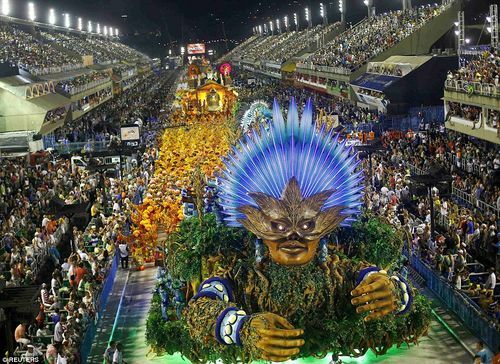 Rio de Janeiro will be hosting the 2016 Olympics in August of this year. The town was filled with excitement because we arrived during Carnival. This is the happiest time of the year for Brazilians. The picture below says it all. We sat in the stands as the groups called schools passed by. The color and skills of the dancers and wonderful music are judged and the best schools are invited to the finals. Amazonia is one of the states of the Amazon Basin and is sometimes referred to as a jungle. It is in fact a rainforest with a canopy of trees and home to many species of plants and animals. 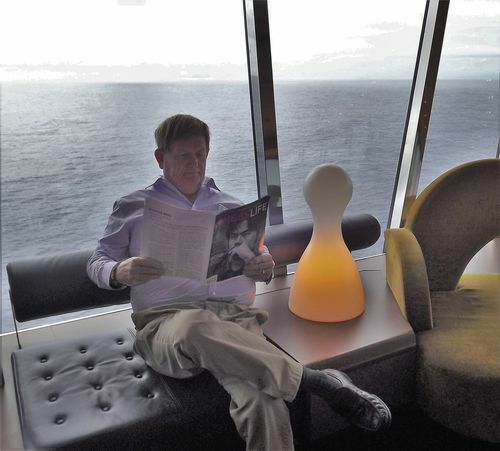 I got there on a cruise ship. 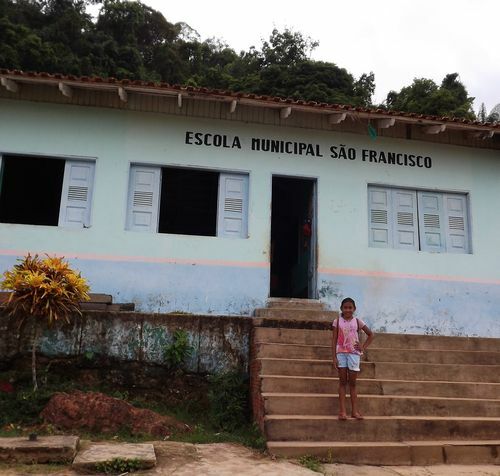 I had been informed that we would be stopping at a village called Boca da Valeria that was on one of the smaller rivers that flow into the Amazon River. It took several days of sailing before we reached the village. The ship had to anchor in the river because the water was too shallow near the village. Our ship lowered tender boats and they took us to the village. I took my chess set with me as I had decided months before that I would introduce chess to the young people of this village. As I stepped on land my wife, Susan, and I were greeted by children who took our hand and acted as our guides. Susan’s guide was a young girl named Diane. We proceeded through the village and came to the school house. It was elevated because of the flooding of the river. We walked up the steps and entered the school and found a teacher who was accepting gifts from the cruise ship passengers. I looked for a table and laid out the chess board and began setting up the pieces. Diane, my wife’s guide, walked over and sat down opposite me. I did not speak Portuguese and Diane did not speak a word of English. I made the move e4 and pointed to the black pawn and she replied with e5. Then, she mirrored my moves. After a few moves I stopped and set up the pieces to the starting position. I then pointed to my pieces and she moved the white’s pawn to e4. She continued until she had repeated all the moves exactly as I had shown her. I left the chess set in the school and indicated that it was for the children. I found out later from some other cruise ship passengers that some of the children who knew how to play chess were using the set. After dinner, I went up to the library and met Bob Michie from Austin, Texas. He and I had been playing some casual games just before we reached the village. Bob is a PhD physicist who mainly studied and worked applying physics to unsolved engineering problems and a pilot with a passion for travel. We shared many stories about the places we had been. It was a pleasure to play several times over the remainder of the trip. 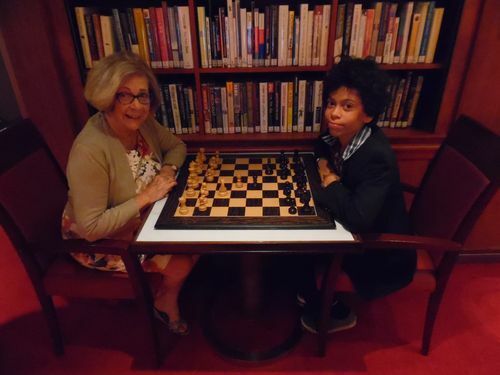 I replied, “No, I simply love to play the game, and I see you are playing a young man.” She replied that he was her 12 year-old grandson, Diego Dos Santos, and they were just moving the pieces around and learning the game. I do not recall ever seeing on any cruise ship I have sailed on a grandmother play chess with her grandson. 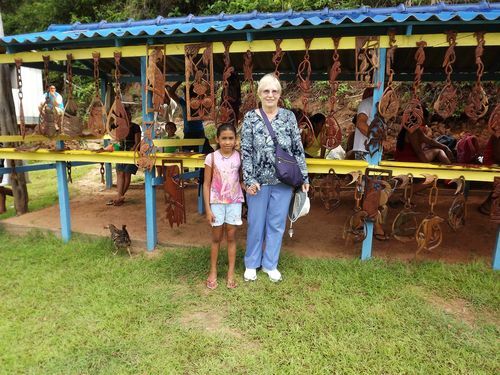 I asked Kathleen, “How does it happen that your grandson is sailing on this cruise ship?” She replied, “He is on a trip to visit his father’s country. He was born in Los Angeles and has dual citizenship-USA and Brazil.” I offered to share a lesson with them. 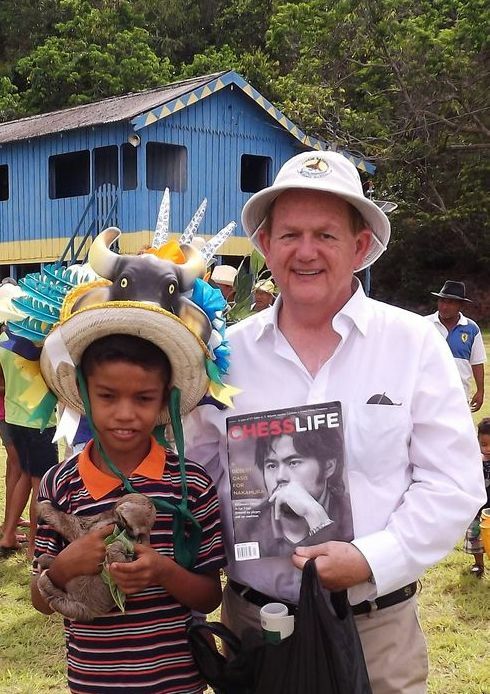 Just as I felt that Brazilian chess and the Amazonian experience were at its peak, I met another chess player onboard who showed me it was a small world. 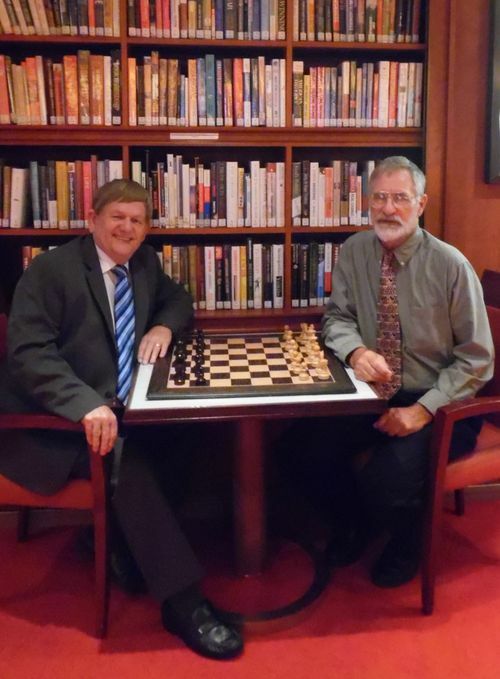 Wendell Bollinger from St. Louis, Missouri is a charter member of the Chess Club and Scholastic Center of St. Louis, the most recognizable chess organization in the United States. 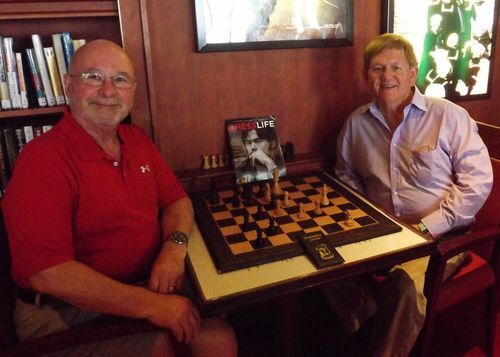 He happened to be seated at one of the chess sets in the library during the last few days of our trip. I stopped and asked if he played chess and would he care for a game. He eagerly accepted. The action was fierce and challenging. Although I won the first game, I learned that his skill came from his previous chess playing many years ago. I lost the second game, but losses are learning opportunities for the future. Chess is never ending no matter where in the world you happen to be. It is still an international language.